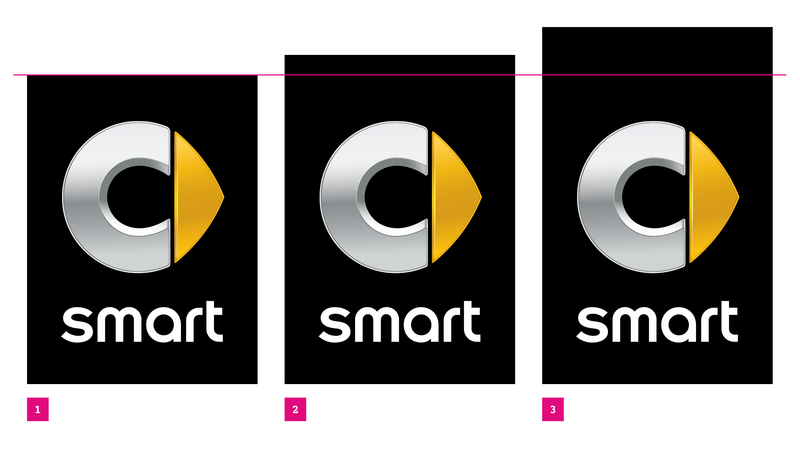 The new FOR smart font applies for every product campaign or graphic material and all documents starting from 1st of September 2015. Please make sure you are using the latest version of the templates provided for download. How to use our label and typography on screen. This manual will teach you how to work on screens. You may have noticed that we've updated a few things. That includes our film endings. The label is placed at the top right corner of the screen format. It’s similar to our other media, remember? We put together a new animation for our label which fades in at the end of every spot. Additionally, we added a soundlogo to the label animation. It’s our spoken brand name. Currently, there are different versions of our film endings. This section is all about them. The ending – option A. 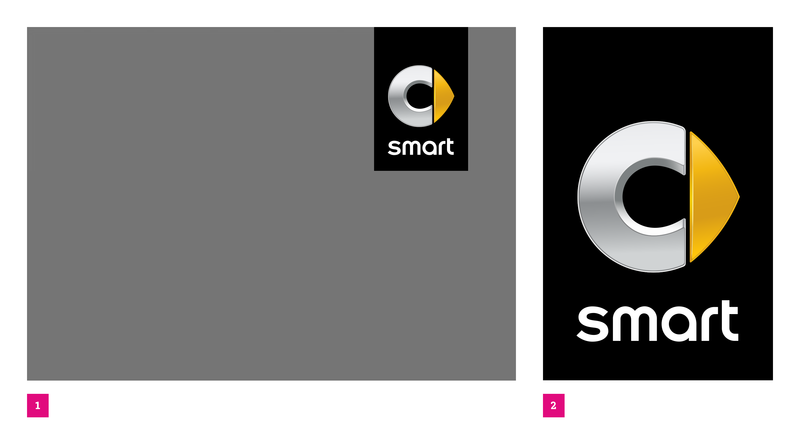 Here is an example of film concept A in one of our commercials. 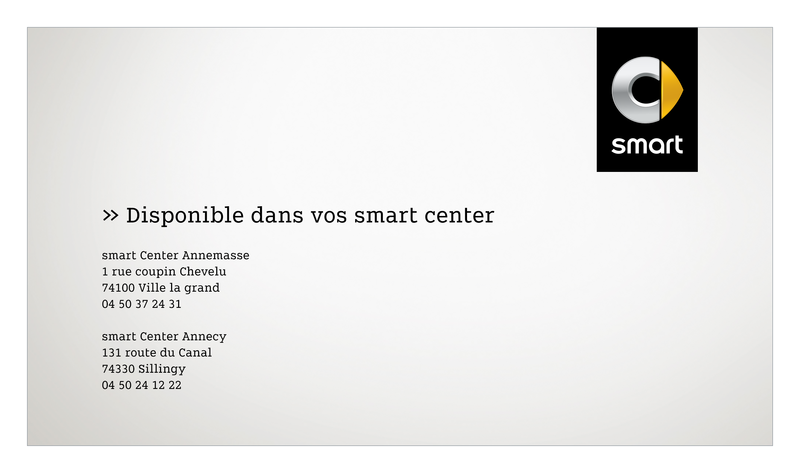 (03-05) Commercial part 2, packshot (smart label fades in before final text chart). 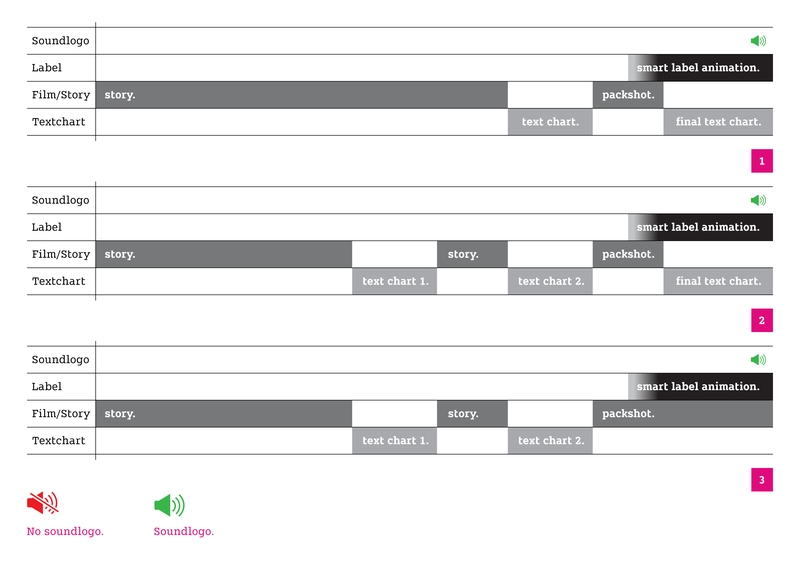 (06) Final text chart with blinking animation and soundlogo. The ending – option B. This is another example of how our films can be built up when they’re ending with a packshot. The usage of a final text chart is optional. 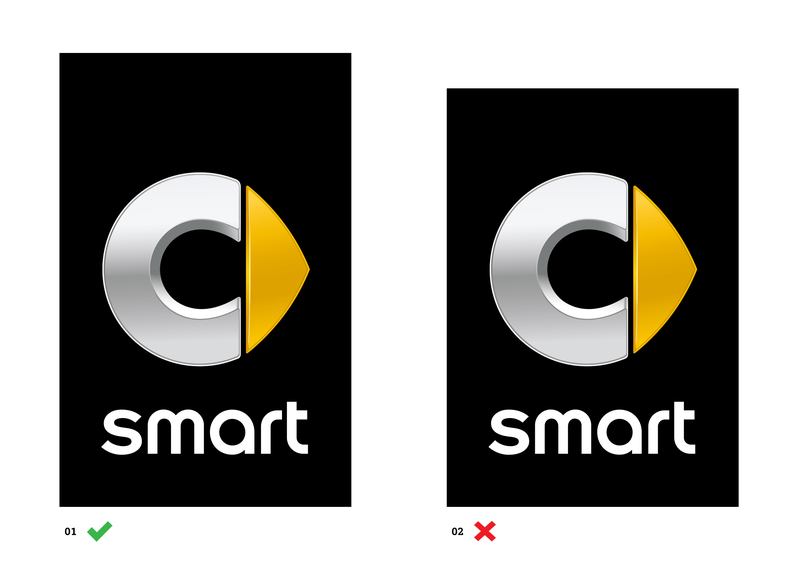 (05-06) Final packshot (smart label fades in) with blinking animation and soundlogo at the end (only if no final text chart 07). 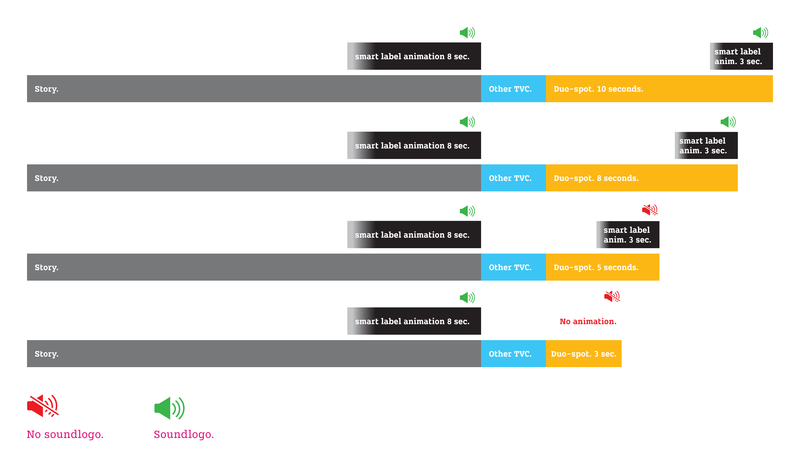 (07) Optional: Final text chart with blinking animation and soundlogo. These are examples of how our films can be built up. (01) Film concept option A. (02) Film concept option B. (03) Film concept option B without final text chart. Sometimes we have extra scenes. This section explains those scenarios. The film concept – tag-on. This is an example of how our tag-ons should be built up. 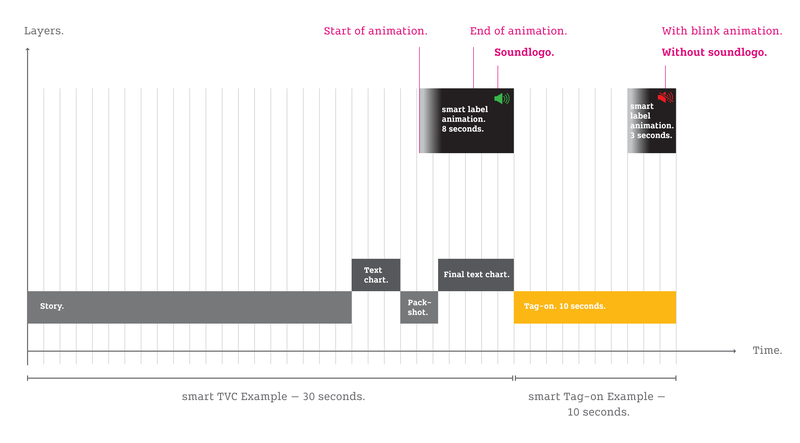 Tag-ons are extra 10 seconds scenes added immediately after the main TVC (e.g. product range and / or offer after TVC). In this scenario please use no soundlogo at the end of the tag-on in order to avoid overbranding. 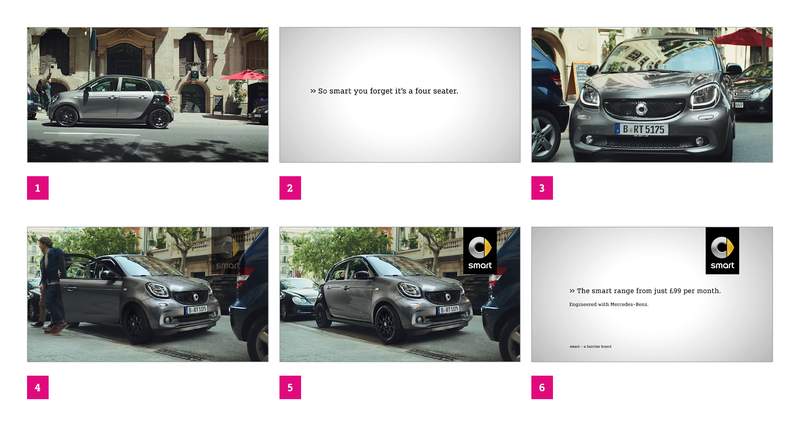 The film concept – duo-spot. This is an example of how our duo-spots should be built up. 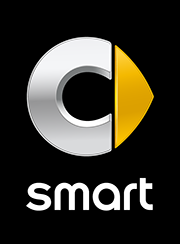 Duo-spot is a spot following the initial commercial separated by another brand commercial. Both spots are related to each other. In this case we use our soundlogo in both commercials. The tag-on & duo-spot concept overview. This is an overview of further tag-on and duo-spot scenarios. 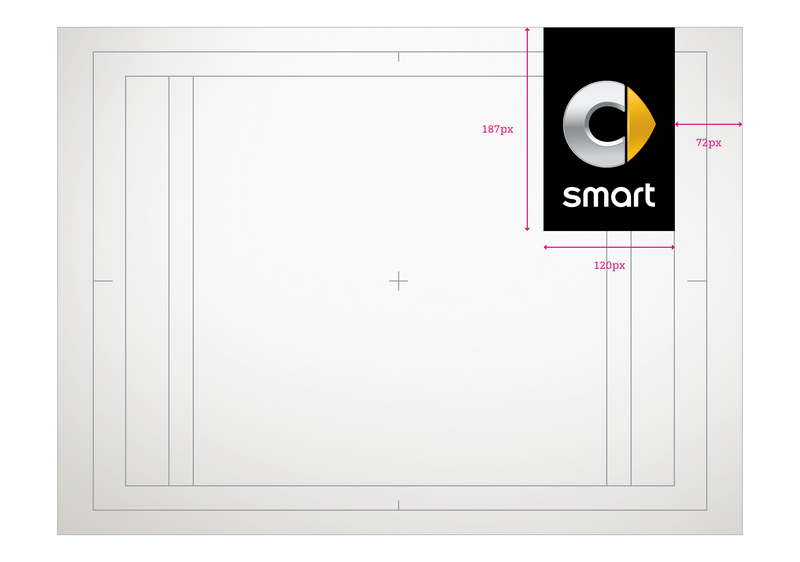 Take the label, video editing software and this manual – the result is a versatile new label animation for our spots. The label animation is 8 seconds long. Although the length can be altered, it should never be shorter than 5.5 seconds. Main animation. Application in TVC, documentaries, film features, etc. For short spots (up to 13s) there is a 3-second animation available. 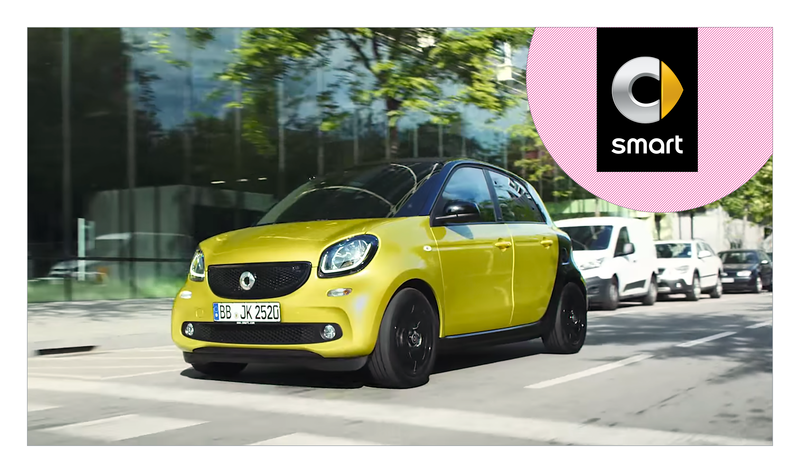 Please contact the smart HQ. The 8 second animation is the main animation and should always be used. 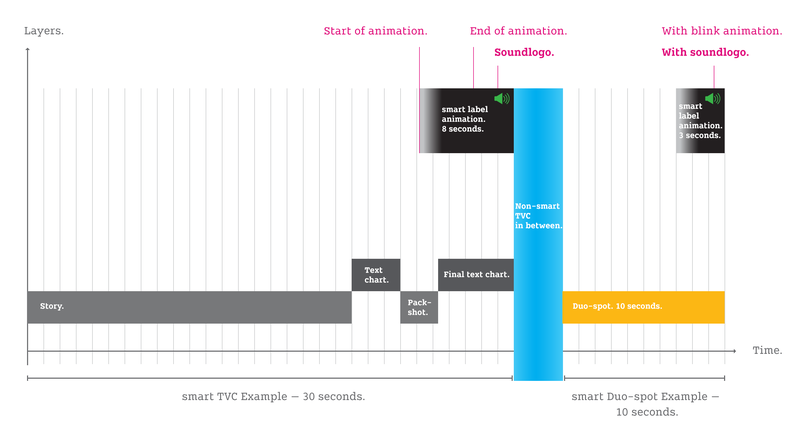 If required by concepts, the timing of the animation can be changed to 5.5 seconds. 8 seconds shortened to 5.5 seconds. Before you start editing, read this page. Because cutting our film-ending is bound by one simple rule: don't touch the animations. Know when to stop – and when to start. Timing is everything. 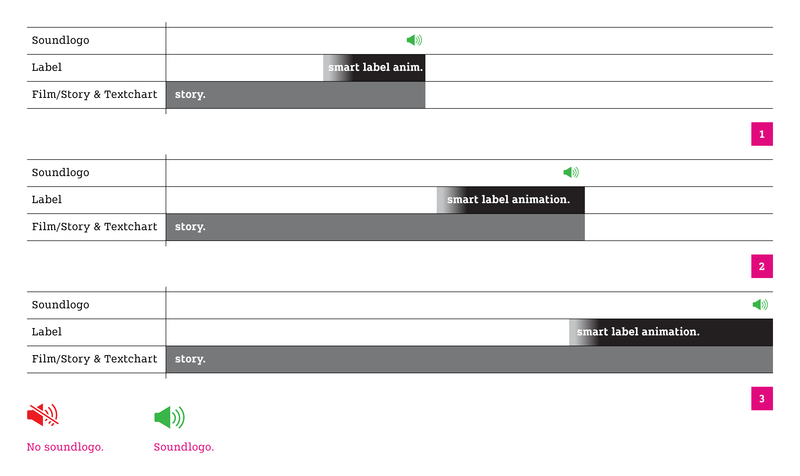 The timeframe for the label animation is counted from the end of the spot (text charts included). 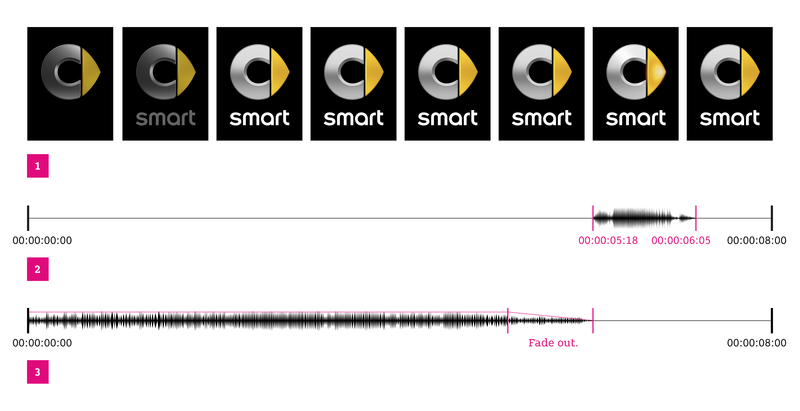 If the label animation is 8 seconds long, it starts 8 seconds before the spot ends and fades in at the top right corner, parallel to the film. The label animation ends with the ending of the film. > Animation: 3 seconds (including blink animation and soundlogo). 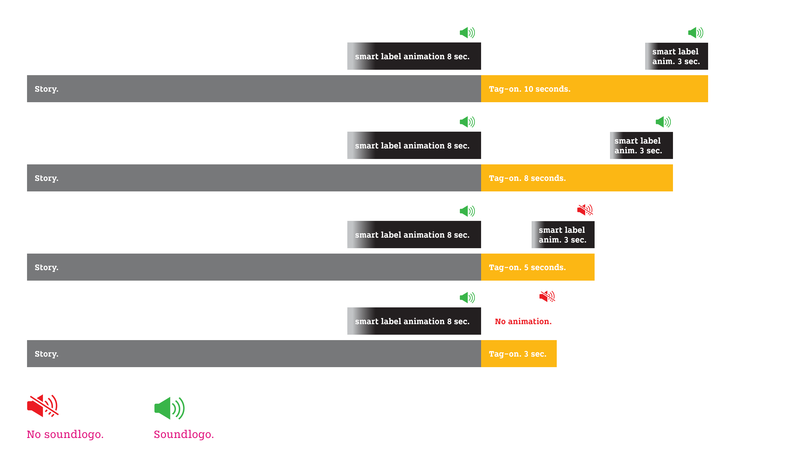 > Animation: 5.5 seconds (including blink animation and soundlogo). 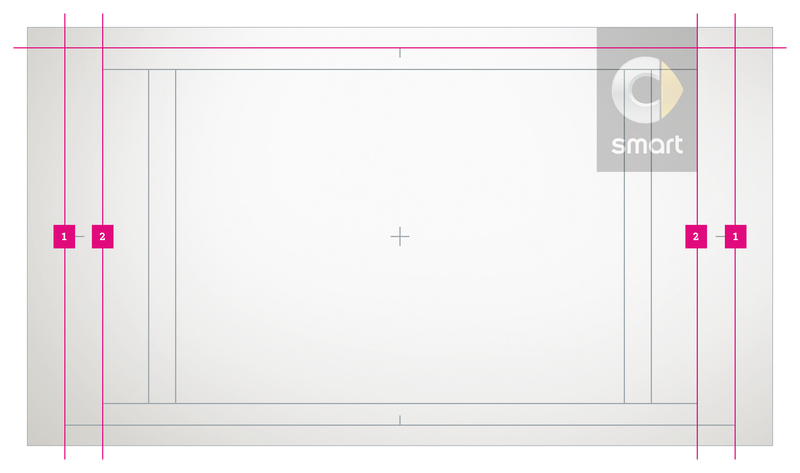 > Animation: 8 seconds (including blink animation and soundlogo). (01) Film/story & textcharts up to 13 seconds. (02) Film/story & textcharts 14–29 seconds. (03) Film/story & textcharts 30 seconds or more. The new film endings didn’t just get a new look but also a new sound. We don’t want our spots to be noisy, so make sure you time the entry of every sound correctly. The soundlogo starts with the blinking animation. By then all other sounds (like background music) need to fade out. There are three soundlogo versions with different audio settings. All supplied videos are accompanied by an audio track of 0 dB. In the Soundlogo.zip available you’ll find the following audio tracks, separated by the respective field of application: 0 dB, -9 dB und -23 LUFS. Just like our print media, our text charts have a well-thought-out layout. Spots use modified versions of our label. This is how they differ from one another. (01) The original label. Our label had to be adapted to screens, so you cannot use the original label. (02) The standard screen label. The screen label has more black space on top than the one used for prints. (03) The special screen label. This is the label for 4:3 formats where loss of format can be expected. 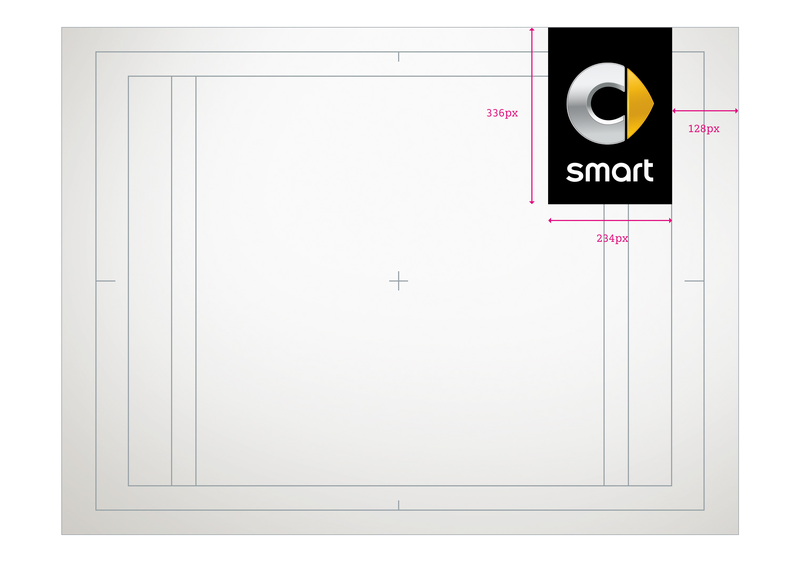 Now we’ll show you how to use the elements on a screen using the example of Full HD (format 16:9, 1920x1080px). Instead of a black screen, we use a bright gradient for our text charts. Working on screens means working with a special grid. All elements on the layout need to be placed accordingly. (01) Action safe area. The ringlogo needs to be below the axis of the action safe area so it doesn’t get cut. (02) Title safe area. 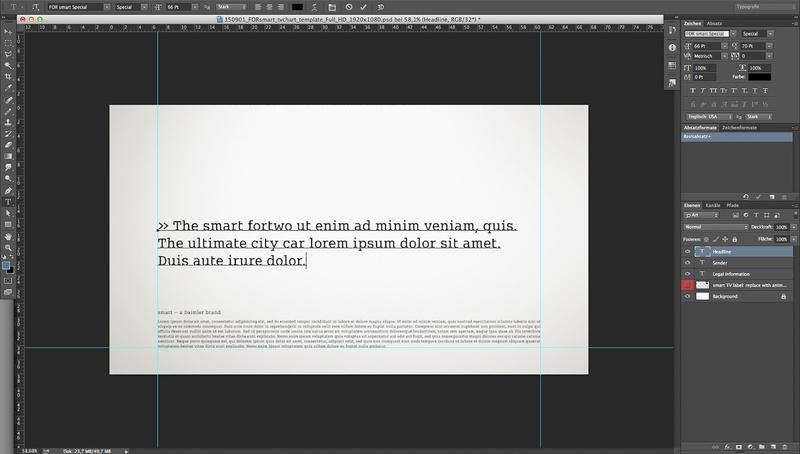 Sets the grid for texts, the label is aligned right to it. 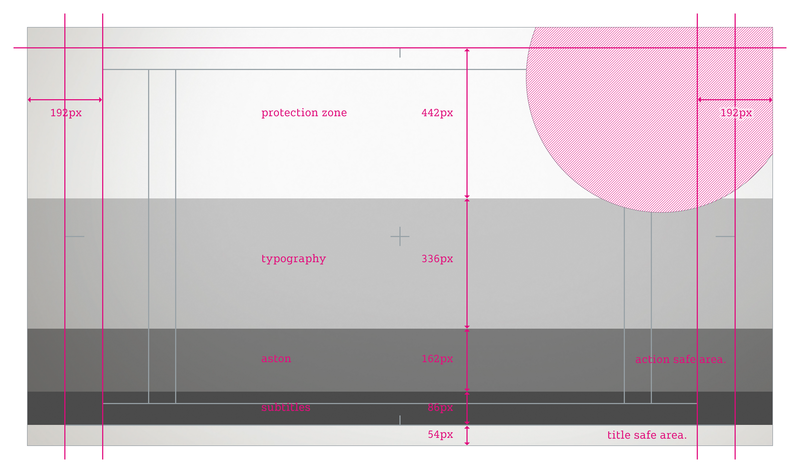 Title safe area to edge: 10% of width. 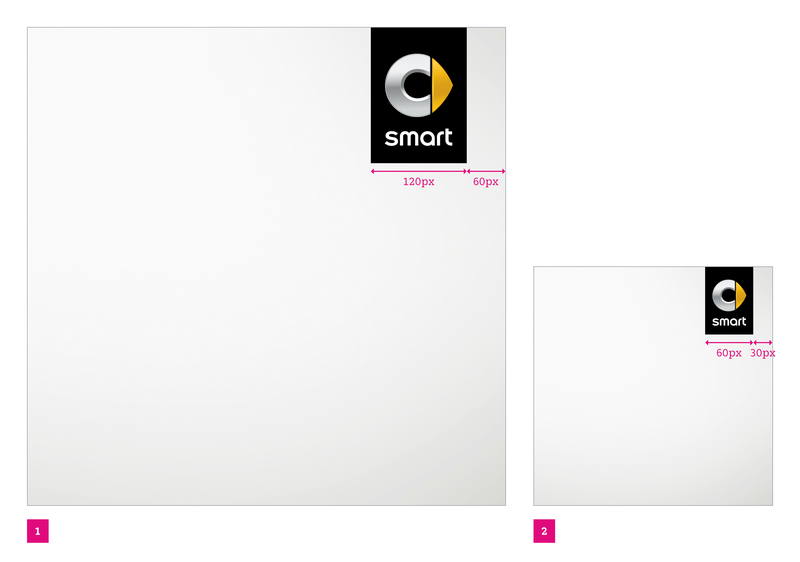 As always, the size of our label depends on the format you’re working with. By doing a little math, it can be defined for every screen. (01) Distance results from the right alignment to the title safe area. (02) Height screen label: total height×0.35*=1080×0.35* = 378px. (*) Factor for label size calculations. (03) Width results from the height. 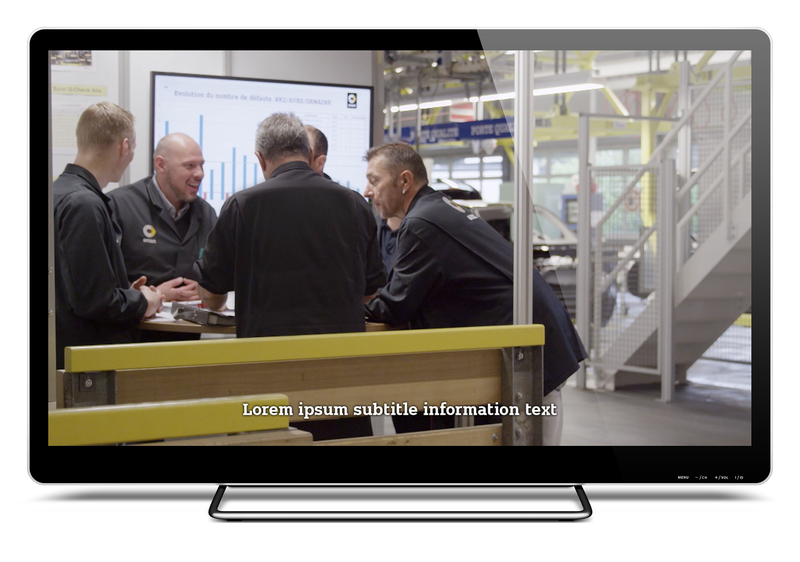 This should explain the main settings for text on our TV charts but we’ve also prepared templates, so you only need to fill in your content. Headlines use a ragged left alignment and shouldn't be longer than three lines. 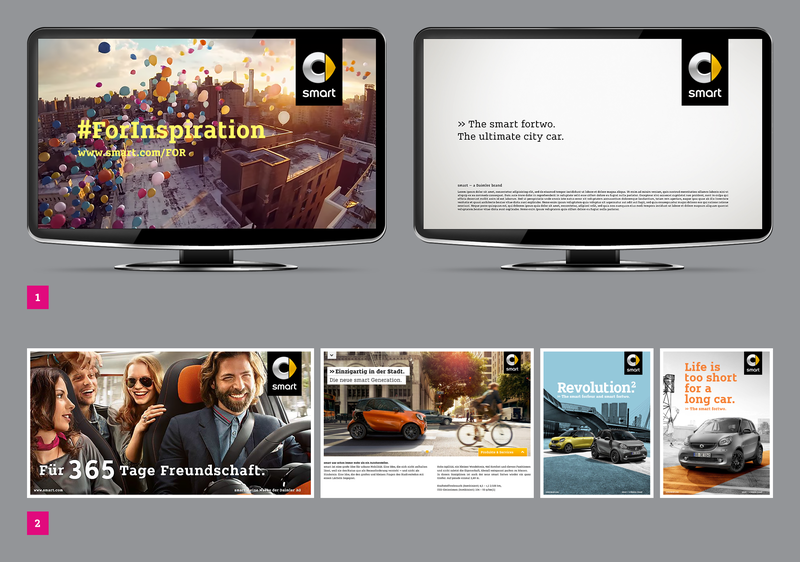 The FOR smart Special is used for headlines as well as for the sender and all legal information. The legal information is set in full justification (last line flush left). The kerning values were optimised so the setting should be metric. (01) Headlines. Recommended values for Full HD: Font size (FS)=66pt. 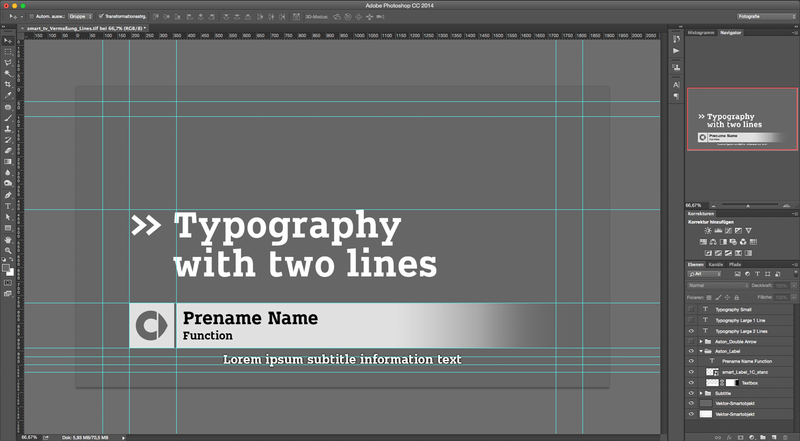 Line spacing (LS)=70pt. Character spacing (CS)=0. LS=1.06×FS. (02) Sender. Recommended values for Full HD: Font size (FS)=24pt. Character spacing (CS)=0. (03) Legal information. 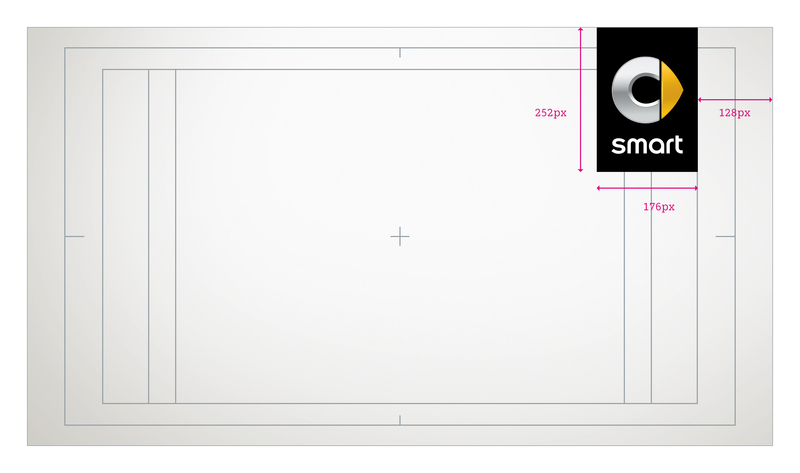 Recommended values for Full HD: Font size (FS)=18pt. Line spacing (LS)=19.8pt. Character spacing (CS)=0. LS=1.1×FS. 4. 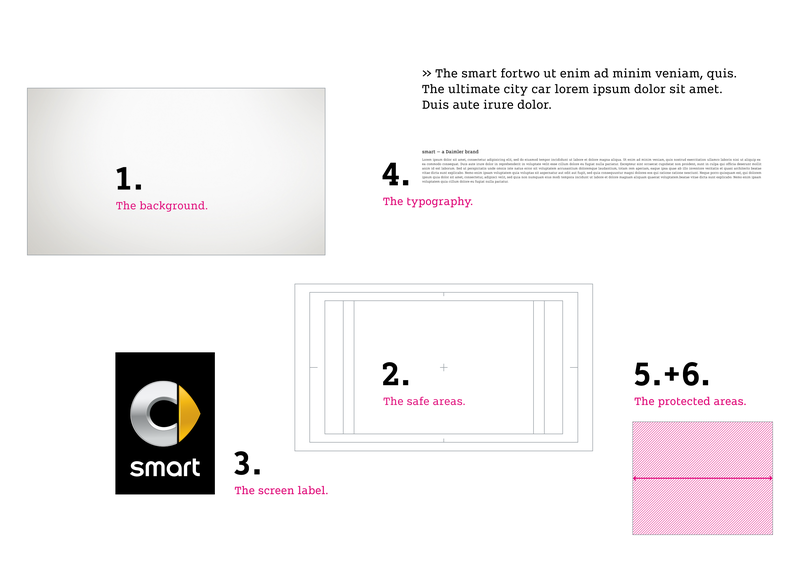 The typography — square format. This should explain the main settings for text on our TV charts but we’ve also prepared templates, so you only need to fill in your content. (01) Example square format (600x600 px). (02) Example square format (600x600 px). 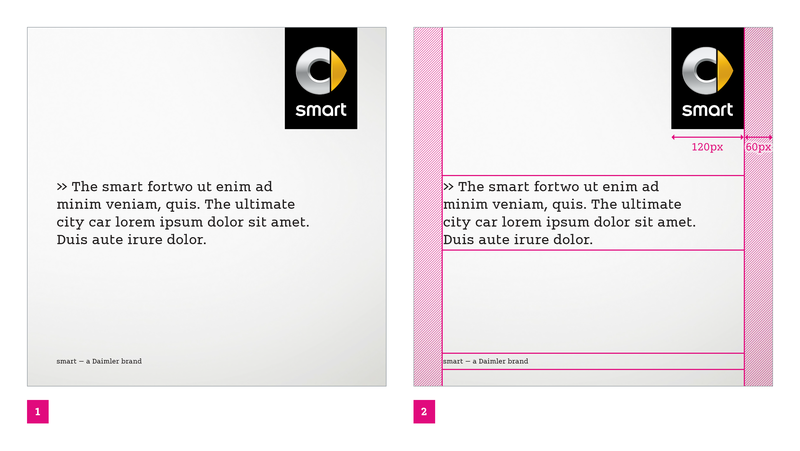 The grid system requires some distance between borders and contents. Protection zones are defined by the title safe area. These areas have to be kept clear from any CI-material. 6. The label protection zone. Protection zone of the label on text charts. If you added all the elements to the right places, this is what the layout looks like on Full HD (1920x1080) screens. Example: Dealer addresses. Here is an example for handling dealer addresses. The label protection zone in film. If you want to show a product, make sure it doesn’t collide with the label. > 4k Ultra HD (3840x2160). > 4k Digital cinema (4096x1714). > PoS and Infoscreens (1280x960). The special screen label comes into use in films produced in the 4:3 formats NTSC (720x534) and PAL (788x576). In this case, the special label comes into use. The square format is often used in social media. 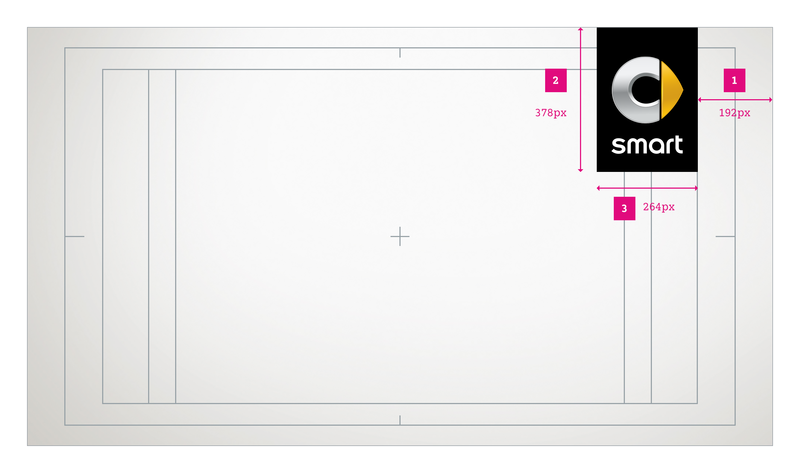 In case of square formats for social media video specs: use measurements as shown. (02) Example square format (300x300 px). There are some simple rules of thumb: no tricks, no effects, no shadows, no animations. To place the typography on screen in the correct region, please consider the measurements and information in the following examples. Always place typography on screen horizontally on the left side with double arrows. We prepared a template with the right measurements. There are two different font sizes available. Depending on the length of the text, it’s up to you to choose the right setting. Don’t use any effects, tricks, shadows or animations for typography on screen. Typography is always left-aligned and horizontal. The astons are predefined for the specific resolutions and are always placed at the same position. > Aston version 1 (with smart label). > Aston version 2 (with double arrow). Subtitles in moving images are always in FOR smart Bold. For subtitles it’s okay to use effects (shine/shadow) to guarantee a readability on bright as well as on dark backgrounds. Subtitles are also centre-aligned. For Full HD (1920x1080 px) the subtitle is in FOR smart Bold 55 pt. 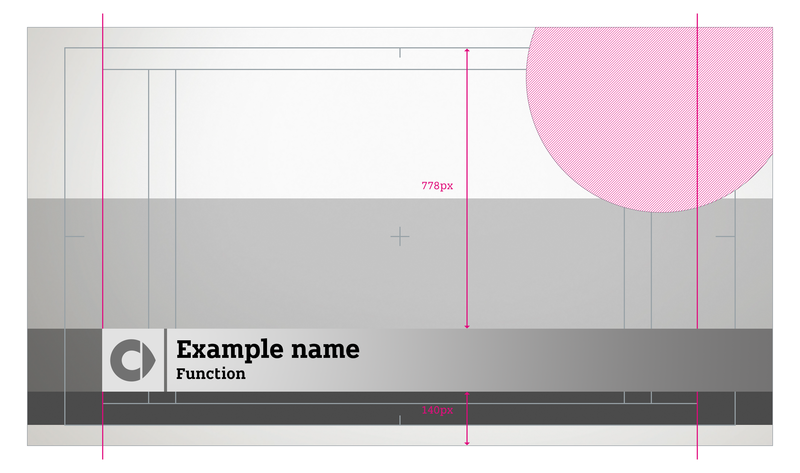 To make it easier for you, we’ve prepared template files with the right measurements and settings for typography, aston and subtitles on separate layers. There’s a collection of all the data you need. To get more information about the contents, pay attention to what is published in the following section. The animation is available in two formats: 1080p 50fps and pure label. 1080p 50fps with the proper positioning of the label at the top right corner when used in a 16:9 format. Depending on the video format as RGBA (animation incl. transparency information) or pure RGB for use with an alpha mask. 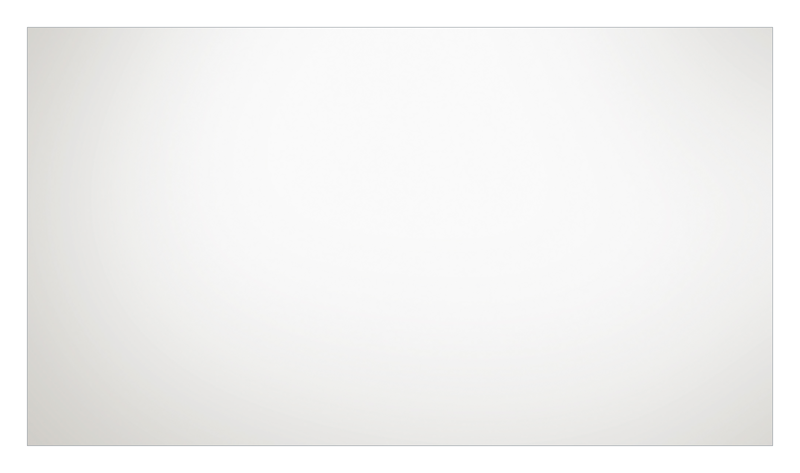 Standard screen label as pure label, if needed for the usage in another format than 16:9. As some video formats do not support unusual aspect ratios, there’s only a limited range of video formats. 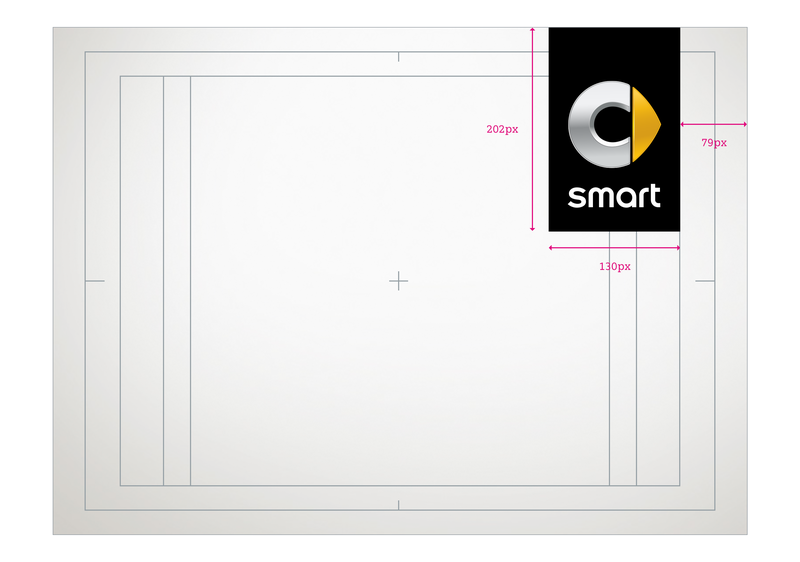 The pure label animation has the following settings: 579x830p 50fps. It’s only available as QT Animation (lossless video codec) and H.264 (lossy-coded). The 4:3 formats NTSC (534p 30fps) and PAL (576p 25fps) have different settings. If possible, avoid using these files. For viewing purposes/inclusion. Not intended for further professional processing. Including transparency information. Not qualified for viewing purposes2. Intended for further professional processing in the most common software. Only intended for further professional processing in AVID. QT Animation Including transparency information. Not qualified for viewing purposes2. To make it easier for you, we’ve prepared the text charts as template files, so you only need to put in your content and link it with your editing application. 1 H.264 doesn’t support the integrated alpha channel which is why it is attached as a separate animation. How to use an alpha mask depends on the editing software. 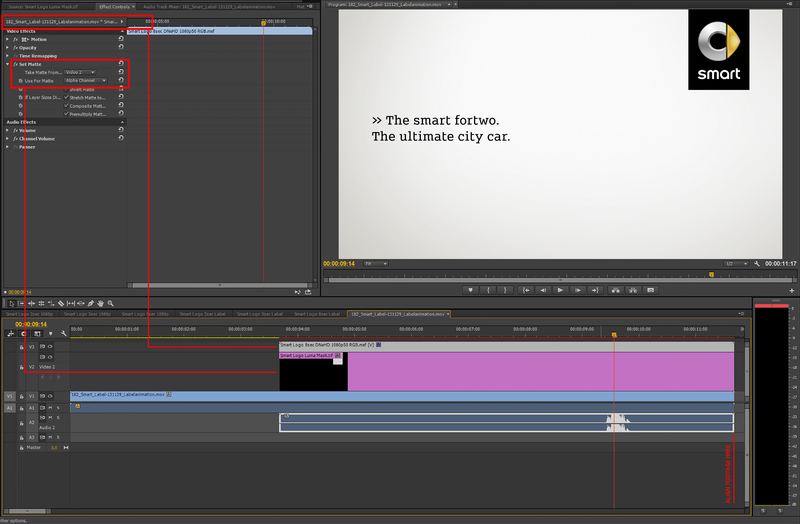 A sample setup in Adobe Premiere is depicted above. 2 Since the videos are only minimally compressed for further processing, most players are overloaded with play-back. Only use these files in the adequate software, such as Adobe Premiere or Adobe After Effects. Our literature. Our web, mobile, apps & screens.